Northwest Colorado Springs exemplifies the true spirit of community. Affected dramatically by the Waldo Canyon fire, the residents here have come together and rebuilt, and this area remains one of the most desirable places to own a home in town. Foreclosed condos and townhomes here can sell for under $75K, while large, late model homes can often be found in the low 200's. 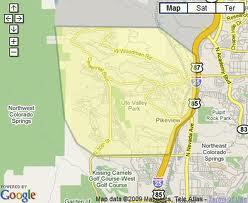 Northwest Colorado Springs boasts some of the most well known neighborhoods in town. Rockrimmon was one of the original neighborhoods here, and is still well known for beautiful homes among pinion bluffs. Peregrine, Mountain Shadows and Hunter's Pointe neighborhoods are here as well, all of which are great places to locate a foreclosure. Living in Northwest Colorado Springs means living the Colorado lifestyle to the fullest. Ute Valley Park, one of the most popular parks for hiking, mountain biking and wildlife viewing is located here, and the Garden of the Gods park is just south of here, known word-wide for its spectacular towering sandstone formations. Many city parks are strewn throughout the area as well, including Woodmen Valley Park, Wilson Ranch Park and Foothills Park, just to name a few. Northwest Colorado Springs also has plenty of retail, dining and entertainment areas. Garden of the Gods Rd to the South features numerous shopping areas and restaurants. Rockrimmon Blvd also provides easy access to Woodmen rd and shopping, dining and entertainment on N. Academy Blvd, including the Chapel Hills Mall. I-25 borders the area to the east, providing easy access to the Air Force Academy, Monument and Denver to the north; as well as Downtown Colorado Springs and Fort Carson to the south. There are two public school districts in the area, District 11 and Air Academy District 20. Most of the High School students attend either Air Academy High School or Coronado. Other notable schools in the area are Eagleview Middle School and Foothills Elementary. Northeast Colorado Springs offers everything from great foreclosure deals to wonderful parks, shopping, dining and entertainment areas and fantastic schools. Buying a home here is a smart decision. Click here to search all Northwest Colorado Springs homes for sale.